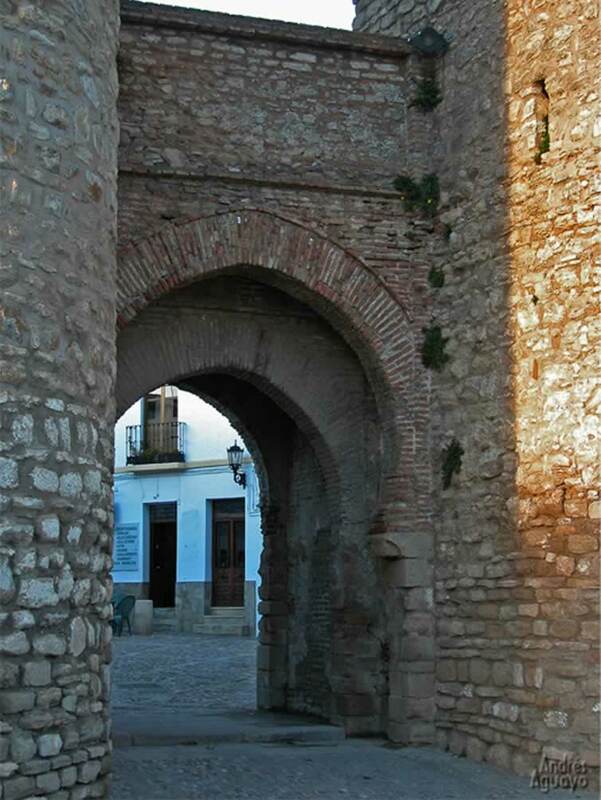 Ronda City Walls & Gates Map, description & photographs, Built by the Arabs, Andalusia. 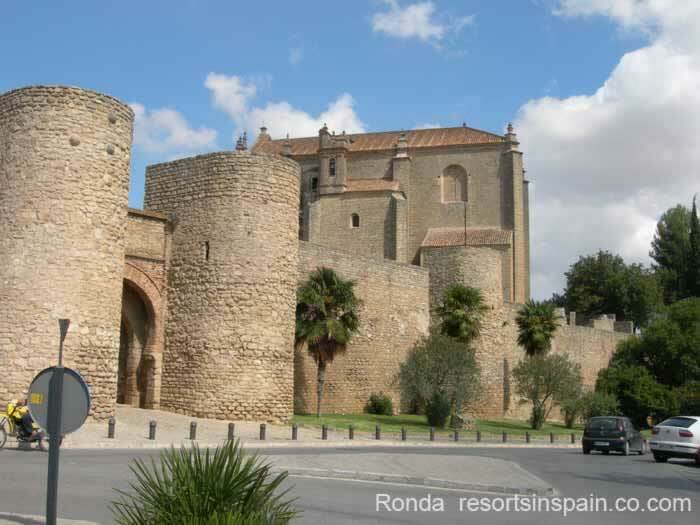 This Ronda City Walls & Gates Map shows the Cities gates & ancient defence walls, popular attractions, places of interest & transport locations. Click the name in the right column to highlight the location on the map. 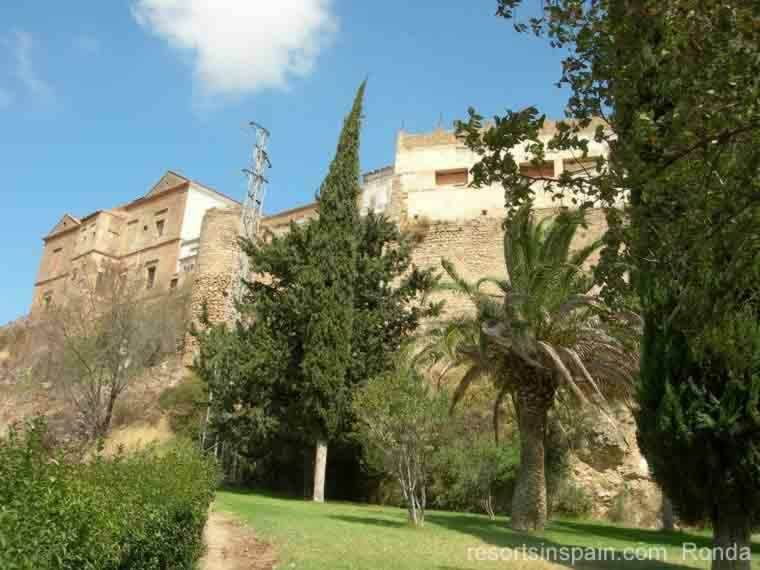 Ronda City Walls & Gates, Citadel (Alcazaba) Walls description & photographs. 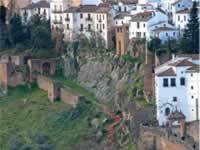 The City walls and castle of Ronda as built by the Moors and the location with steep shear cliffs on 2 sides and steep hillside on the other 2 were so strong that they were unbeatable by warfare methods of the age, i.e. bows & arrows and various stone hurling machines. For years Christian armies had by passed Ronda Knowing that the defensives were too strong. The introduction of the use of cannon, first used in Europe in, funnily enough used in Spain in the siege of Cordoba only a few years before the siege of Ronda changed the situation. By miss information the Christian Army had drawn away most of the Moors army to defend Malaga. Besides bombarding the defensives with canon fire, destroying the octagonal tower in the process, the Christians had also found out about the 'secret' Mine water entrance in the gorge which they attacked and finally captured and thus cut off the Moors from there water supply. Within a few days the Moors had to surrender. 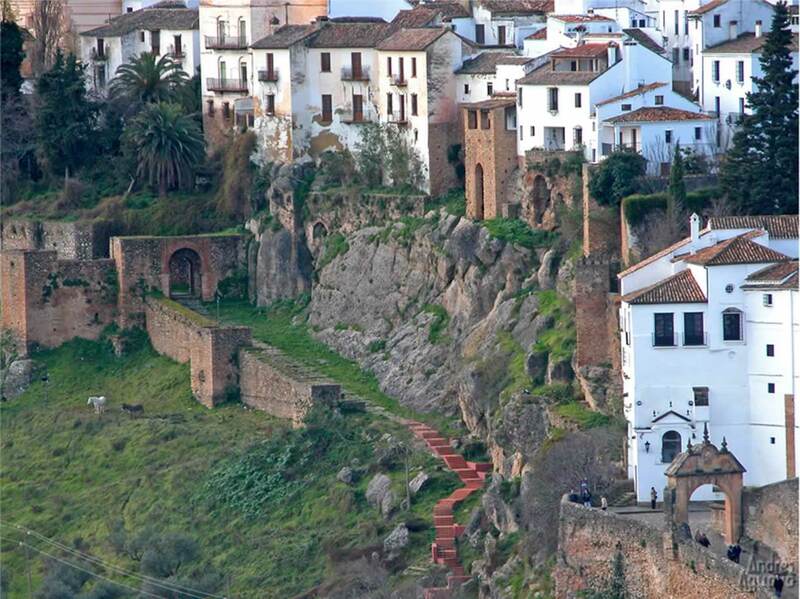 The Almocabar Walls are located on the southern side of Ronda and and well preserved and you can walk along the walls. was the main gate leading to the coast. 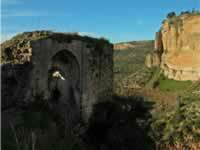 Therefore this is usually the first close up site of Ronda that Tourists from the Costa del Sol see. Just inside the gate is a small plaza with a bar, cafe & a souvenir shop. on the right the road peters out into a footpath taking you outside the city walls. There are various footpaths outside the walls or lower down is a minor road running parallel to the walls and next to this road are the ruins of the outer defensive walls. 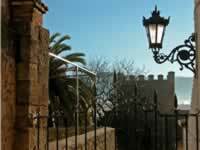 The Almocabar gate and Almocabar walls take there name from the Moorish word ‘Al maqabir’ meaning cemetery. By tradition Moorish cemeteries were built outside the city walls and the one at Ronda was located opposite the gate in what is now the Plaza Ruedo Alameda. 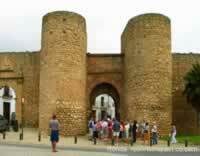 The Charles V Gate was built by Charles V in the 16th century in a renaissance style. Above the arch is a crest containing the Spanish empire eagle on it. Photo on left: The Charles V Gate is on the extreme left and a group of tourists with tour guide are outside the Almocabar Gate. The walls of the Albacara sloping down from just left of centre to lower left. Path into the area near the Albacara Walls in the mouth of Ronda Gorge from the gorge top. The wall is located in the mouth of the gorge roughly half way up the gorge. The wall ends with a shear drop to the gorge bottom and protects a slop that leads right up to the gorge top lip. There is a footpath up to the Plaza de María Auxiliadora in the old towns. The word 'Albacara' comes from the Arabic word 'bab al baqqara' meaning the cattle door. An area into which cattle could be driven if the town suspected an attack. Several very important flour & oil mills were located in the mouth of the gorge behind the wall. An outer defence where the hill side was not as steep. The Mill gate was near the end of the Albacara Wall next to the gorge edge. It was used for access to the mills further into the gorge mouth. Located at the other end of the Albacara Wall built onto a very tall vertical gherkin shaped rock that forms a natural wall. 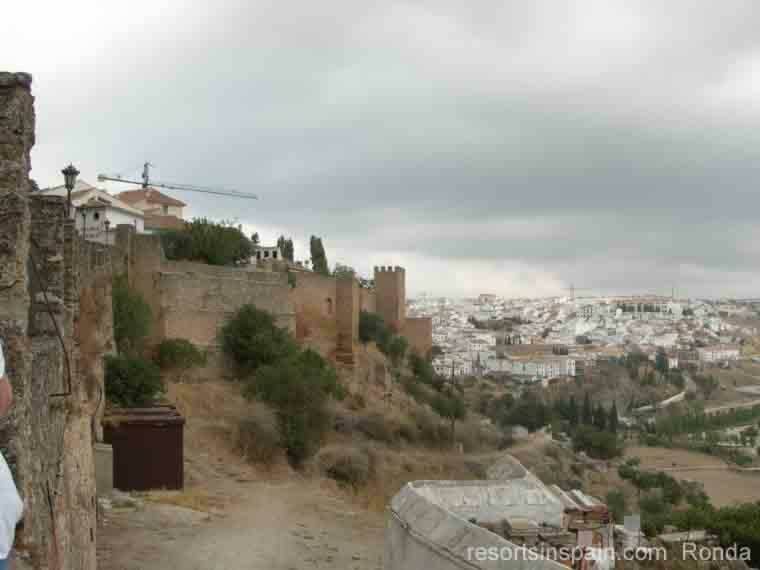 The Levante Walls are located to the East of the Old Town of Ronda (La Ciudad). The Eastern side was a more vulnerable side of the city because the natural defences of high steep cliffs were not present, instead there was a slope in places right up to the walls on the summit, in others up to a small cliff face. Therefore there was a double line of walls & in places a triple line. Main Wall On top of the hillside rise or hillside rise & short rock cliff face. The third wall is by the Cijara Gate (Puerta de la Cijara) and just to the south of the gate an area know as the Carmen Walls (Murallas del Carmen) where there is an enclosed plaza that is sometimes used for events. The Cijara Gate was located in the Levante Walls and a main entrance into the city. The current short outer wall just before the gate probably extended to other gate(s) no longer visible by the Roman Bridge. This gate led into the Jewish Quarter. In the valley bottom below the Cijara Gate is the Arab baths where visitors to Ronda would refresh themselves before entering the city. 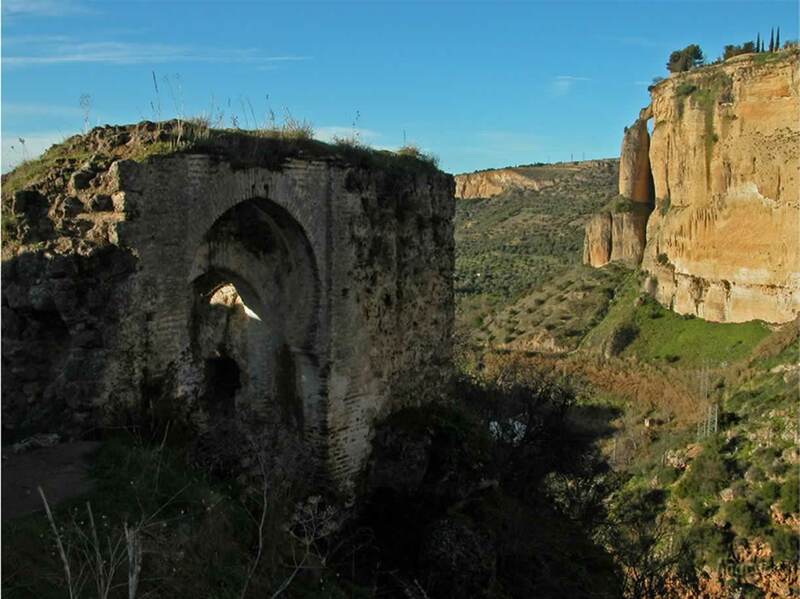 Ronda's Castle, the 'Castillo del Laurel' was built by the Moors on the highest point of Ronda and overlooks, and controls the entrance to the city via the Almocabar Gate and Imágenes Gate no longer in existence. Although partly destroyed by the French in the Peninsular War of 1812 and more so by the Spanish in there road improvement scheme to widen the street 'Calle Imágenes' and the erection of new buildings. The Arch of Philipe V was erected in 1742. The arch replaced a narrow defensive gate built by the Moors in a road improvement scheme and is purely decorative and not defensive. On the arch you will find an inscription and the coats of arms of both the Anjou & Borbons. There is a nice view of the Padre Jesus Church through the arch. The Holy Spirt church was built as a celebration of the Christian victory over the Moors in 1485. The church is built in the location of an octagonal defensive tower built by the moors and it had commanding views of the Almocabar Gate, Almocabar Walls and the approaches to Ronda from the Costa del Sol. The tower was totally destroyed by the cannon fire of the besieging Christian Army.